The Hunt evokes a wintery hike among evergreens. Photo by Matt Sampson. It’s a pretty common notion that the reason certain books and stories are so well loved is because our minds are taken to other worlds and new scenarios when reading them. Ryan Castelaz of Discourse Coffee attempts to achieve that same level of transportation, but via your taste buds and creative drink creations rather than literature. It’s clear that Castelaz is the type of person who takes an idea and gets granular with it, tweaking every minutiae of his creations until it’s up to his exacting standards. But not in a must-be-perfect, Gordon Ramsay-style; rather it seems his perfectionism stems from a genuine curiosity to see just how accurately a story can be delivered via a drink. Cliché as it may be, the passion behind the venture is evident, and makes it no wonder that Discourse has gained notoriety among coffee elite and press attention from notable names such as Food & Wine and Barista Magazine. To get a taste of this alternative approach to serving drinks, I stopped in to sample the winter menu, which debuted earlier this month. The space is cozy, curated and somewhat reminiscent of an I Spy book due to the various tools, glassware and unique ingredients visible. 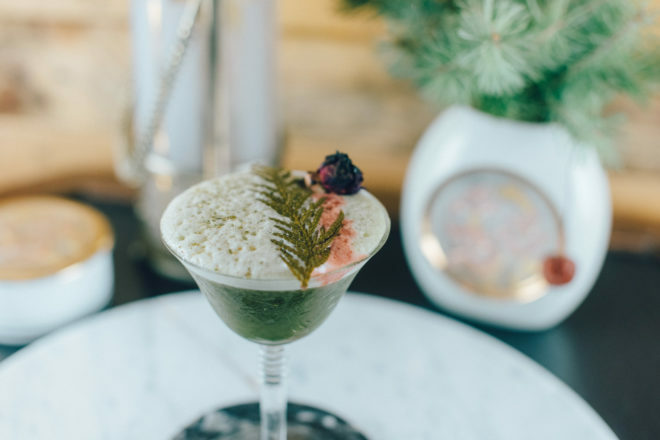 To create these concoctions it takes more than an espresso machine and frother; most drinks served here involve a multi-step, and often multi-day, process to arrive at the final result. Take for example the first of the two drinks I sampled, The Hunt. It is a delicate balancing act of flavors, including citrus, cedar, smoke, spice and an earthy umami. Each of these flavors have their own preparation process before they can be assembled into a drink. The story that inspired The Hunt is a hike through a cold and quiet forest laden with fresh snow in pursuit of the hunted. Served cold with a frothy head marred by a red line leading to the burnt rowan berry, it’s a visual meant to evoke that quietly tense setting. Upon first sip it reminded me of that moment during skiing when you’ve just hiked through deep snow to reach the top of a ridge and found the perfect line down. It’s that brief pause when it’s truly quiet and the chilly air invigorates your lungs, smelling of cedar. It’s cool, refreshing, subtly smoky and bright — a unique experience that doesn’t compare easily with other sips, just as Castelaz hoped. Three unique vessels are used to serve the Montezuma. Photo by Aleah Kidd. The second drink, Montezuma, was in many ways a visit to the other end of the flavor spectrum. It’s a warm, spicy drink with a chocolate and coffee base inspired by the Aztec ruler known for his conquests over the Mayans. There’s three separate vessels involved in the consumption of this drink. The first is a pottery coffee mug that is rough, earth-toned and primitive in style. It’s joined by a cylindrical piece of horsehair pottery filled with a Guatemalan coffee infused with South American chiles and sweet corn. 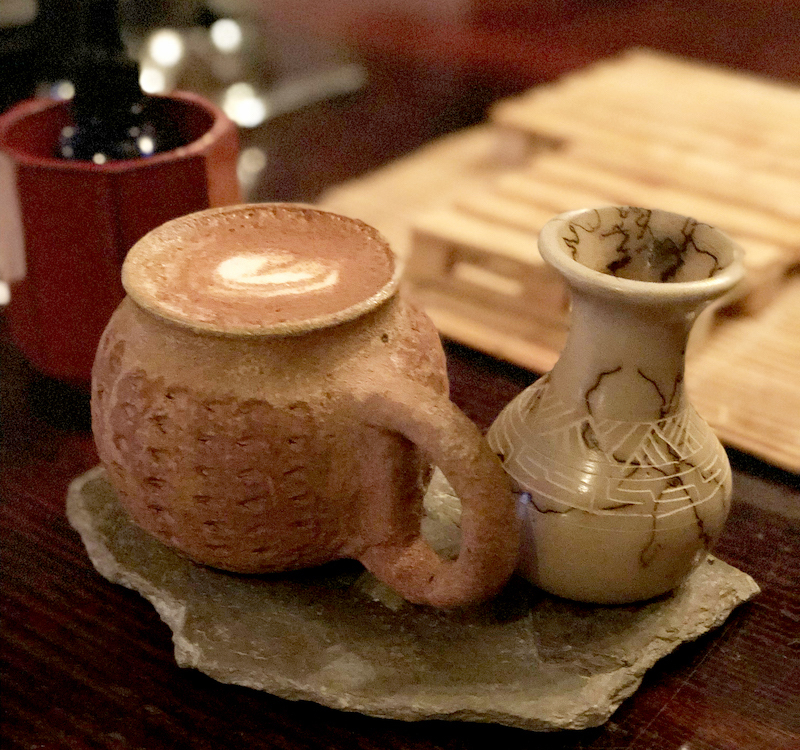 Castelaz found both pieces of pottery while traveling and has been waiting to create a drink that accurately matched their style. The third is a vial with a glass eyedropper that allows you to add a habanero tincture to your drink. The Discourse menu lists this drink as interactive, due to the various steps and vessels used. I began with sipping the chocolatey liquid, which has notes of orange and vanilla and a velvety viscosity mixed with a bit of gritty chili spice. It’s sweet, but in a chocolatey way instead of being overtly sugary. I then added the Guatemalan coffee and the habanero tincture: one to two drops is moderately spicy, and three to four will start to test your tolerance. It’s a wonderful mixture of sweet and smoky upfront, and then a heat to follow that puts color in your cheeks. Both drinks were truly distinct and entertained the taste buds in different ways. The contrast made the experience that much more unique. You can taste the winter menu through the end of January, before the shop takes a winter hiatus. Discourse will reopen in the spring and I look forward to more storied sips and interactive drinks.